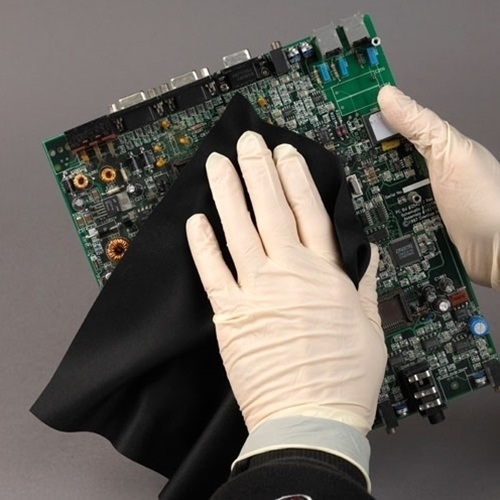 Poly-Onyx™ ESD Wipes combine several advancements and desirable features into one wipe. They are made from black monofilament polyester no-run knit, providing excellent strength, good absorbency and chemical compatibility. These wipers are a good choice for general clean room and equipment maintenance, or any critical applications were lint can be detrimental. However, their black color makes them especially valuable as an inspection wipe for translucent or light colored soils and dusts; as well as for make-up on clean room workers. Special static dissipative fibers are also woven into the fabric to safely relieve potentially damaging static charge.